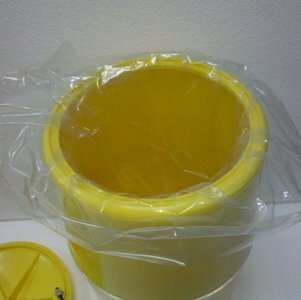 We are a proud manufacturer and supplier of wide range of Plastic Liner Bags in the country renowned for the best quality service. These bags are manufactured in our well equipped and technically advance facilities using premium quality of plastic. We have standard sizes available and can even customize if required. These liners bags can be bought from us at very competitive prices. Established 1991, we have recognized as a distinguished manufacturer and trader of Rotating Air Rings, Air Cooling Rings, Air Ring Parts, Water Bath PP Tubing Plant, Blown Film Plant Parts. Our range of products includes Mono Layer/Multilayer Film Plant, Mono Layer/Multi Layer H.M. Film Plant, Rotating Air Rings, HDPE Non - Rotary Exits Dual Lips, Air Ring for H.M., PP(TO) Blown Film Plant, Dual Lips Rotating Air Ring for L.L.D and Dual Lips Multi Layer Rotating Air Ring. Besides, we provide Irish Ring M/S Galvanize Metal, Bubble Guide, Inserts (Sizer), Self Rotating Cooling Ring, Tarpaulin Tubing Plant Air Ring, Exit Tubing for LD and Extruder Dies. These products are manufactured using high grade aluminum and other components that are obtained from the reliable resources of the industry. Known for their high performance and low maintenance, these products are widely used in blown film plants and any other industrial sectors. We are backed by a team of dedicated and experienced professionals, which allows us in developing the products at par with international standards. These employees work in close consort with each other to achieve the organizational objectives. Moreover, we have established a sound infrastructure facility, which is equipped with all the advanced machinery and tools. Together, with the assistance of our deft professionals and sophisticated manufacturing unit, we are able to customized the products as per the specifications given by the customers.